Neuroimaging Research has grappled with the concept of a “resting brain”. Researchers interested in Consciousness have grappled with localizing subjective states of awareness and the elusive “self”. It seems that contemplative science is bringing both concepts to the table given the profound interest in tracing neurophenomenological states associated with “the self” and intentional, meditative practices. 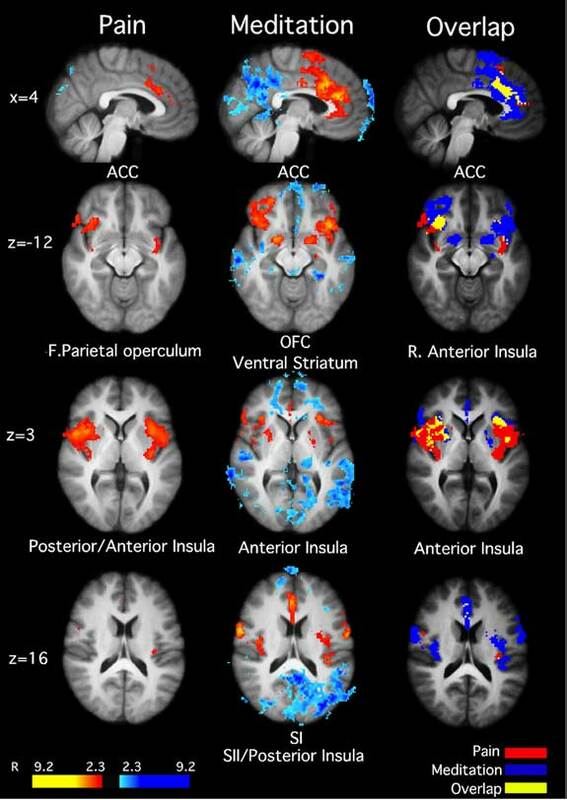 All functional neuroimaging research has focused on Blood-oxygenation-level-dependent (BOLD) changes in the whole brain associated with a particular active, goal-directed, cognitive or emotional function and which has shown to be statistically different from BOLD activity across the whole brain during a “passive” baseline state. The baseline state that most researchers use is typically a 5-6 min long period of passive “rest”. The instructions are typically, “Let your mind freely wander” and “try not to think of anything in particular”. These instructions sound benign and appear to be the perfect baseline state, but as it turns out, [surprise…surprise] a wandering mind is quite active. The mind in this baseline state has shown to have a tendency to wander towards self-reflection (in the past and into the future). Some researchers have called this type of wandering, “mental time travel”. Recently, a growing body of research has investigated the nature of this resting, or “default” state, and has found that brain activation previously considered to be spontaneous noise actually reflects the operation of active and functionally connected neural networks. These patterns of activation has been termed the default mode network (DMN), have been shown to increase during passive states of rest, to diminish during tasks involving attention or goal-directed behavior, and tend to implicate brain areas associated with self-reflection, internal mentation, and narrative self-focus. In many forms of psychopathology, the DMN has been found to be more active during resting states and less likely to decrease in activation during active goal-directed tasks, suggesting a relationship between psychopathology, excessive self-reflection or rumination [about past events], and increased self-projection [into the future]. In a recent study[Link] by friend and colleague, Judson Brewer at Yale University, adept meditators trained in meditation techniques rooted mostly in Theravada (vipassana/insight) traditions actively meditated using multiple types of meditation practices (Concentration, Loving-Kindness, Choiceless Awareness) while being imaged in the MRI. A “mind-wander” rest state was the baseline state in this case, and comparisons were made also between the adepts and a group of novices who had brief instructions how to perform each meditative practice. As seen below, Experienced meditators demonstrate decreased DMN activation during meditation. Brain activation in meditators > controls is shown, collapsed across all meditations (relative to baseline). 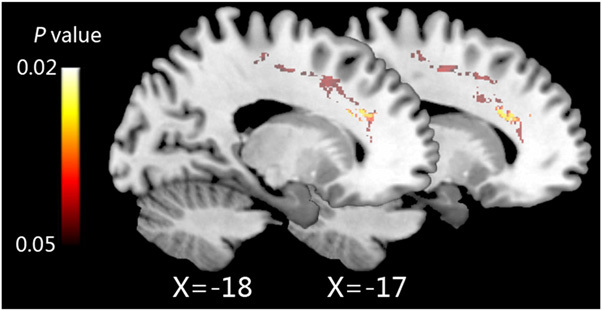 (A and B) BOLD activations were found to be greater in the left mPFC and PCC for adepts. Although, one should take note that the % change was very minimal (about .25 % at most). The mPFC and PCC are critical nodes of activation during typical mind wandering, self-reflection, and the core areas for the DMN. Choiceless Awareness (green bars), Loving-Kindness (red), and Concentration (blue) meditations. Note that decreased activation in PCC in meditators is common across different meditation types. n = 12 per group. You may ask what this means and how it relates to mindfulness and mind-wandering. It suggests that adept meditators spend less time using the self-reflective network or “DMN” while meditating. This makes sense given the heavy reliance on concentration in these practices. But how about when adepts are simply “wandering” during passive rest? Are they like everyone else? Do they also reflect upon themselves in the past or into the future? This study did not quite capture the phenomenological differences between the groups, but it did find that the DMN had different functional connectivity patterns. Using mPFC as a seed region for connectivity, they found increased connectivity with the fusiform gyrus, inferior temporal and parahippocampal gyri, and left posterior insula (among other regions) in meditators relative to controls during meditation. Using the PCC as a seed region, increased connectivity (compared with controls) was found with the dorsal ACC and DLPFC during all meditative states and baseline wandering, suggesting increased cognitive monitoring and working memory across both meditative and passive resting states. It would be helpful to know if there was a qualitative aspect of “wandering” that was about equal for meditators and controls. Similarly, David Creswell and Lisa Kilpatrick demonstrated that 8-weeks of MBSR training showed increased functional connectivity of dmPFC (an anterior DMN region) with an auditory/salience neural network (especially with BA 22/39 (associated with auditory processing) and the dorsal ACC (involved in salience) . 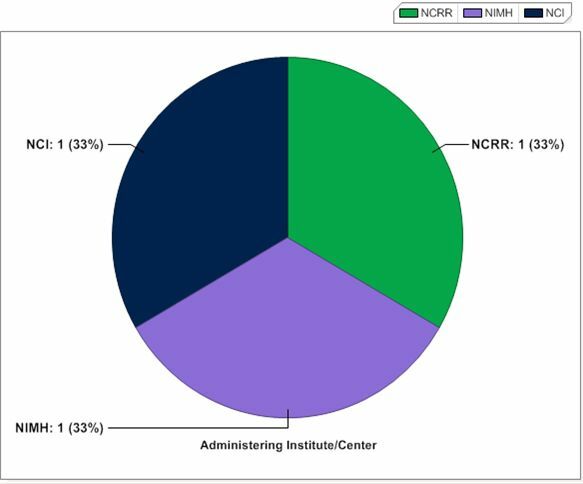 They suggest these results indicate greater positive coherence between self-referential, attention, and auditory sensory processing and may underlie greater attention and reflective awareness of auditory experience in MBSR trained subjects. Again, the DMN is used here as a proxy for a “wandering mind”. Decreased activity in the cortical midline structures that make up this network reflects less self-reflection or narrative self-processing, and suggests more present-centered awareness, monitoring, and attention of interoceptive and exteroceptive stimuli in the environment and associated with the body. The reason I bring attention to this area of research is that contemplative neuroscientists will likely have to take these differences in the DMN between novices and adepts into consideration when scanning meditative states. In other words, a passive mind wandering state may be different between adepts and novices or naives. Thus, between groups comparisons should likely account for these differences and at the very least, quantify the qualitative aspects of mind wandering between groups. There is some evidence that mind wandering is adaptive. One study (for example) by Jonathan Schooler and colleagues demonstrates that increased mind wandering during a boring task increased creativity. Schooler has previously demonstrated a correlation between daydreaming and creativity—those who are more prone to mind-wandering tend to be better at generating new ideas. 1. Brown, C. A. & Jones, A. K. P. (2010). Meditation experience predicts less negative appraisal of pain: Electrophysiological evidence for the involvement of anticipatory neural responses. Pain, 150(3), 428-438. 2. Cho, S., Heiby, E. M., McCracken, L. M., Lee, S. M., & Moon, D. E. (2010). Pain-Related anxiety as a mediator of the effects of mindfulness on physical and psychosocial functioning in chronic pain patients in Korea. The Journal of Pain, 11(8), 789-97. 3. Cusens, B., Duggan, G. B., Thorne, K., & Burch, V. (2010). Evaluation of the breathworks mindfulness-based pain management programme: Effects on well-being and multiple measures of mindfulness. Clinical Psychology & Psychotherapy, 17(1), 63-78. 4. Goyal, M., Haythornthwaite, J., Levine, D., Becker, D., Vaidya, D., Hill-Briggs, F., et al. (2010). Intensive meditation for refractory pain and symptoms. The Journal of Alternative and Complementary Medicine, 16(6), 627-31. 5. Grant, J. A., Courtemanche, J., Duerden, E. G., Duncan, G. H., & Rainville, P. (2010). 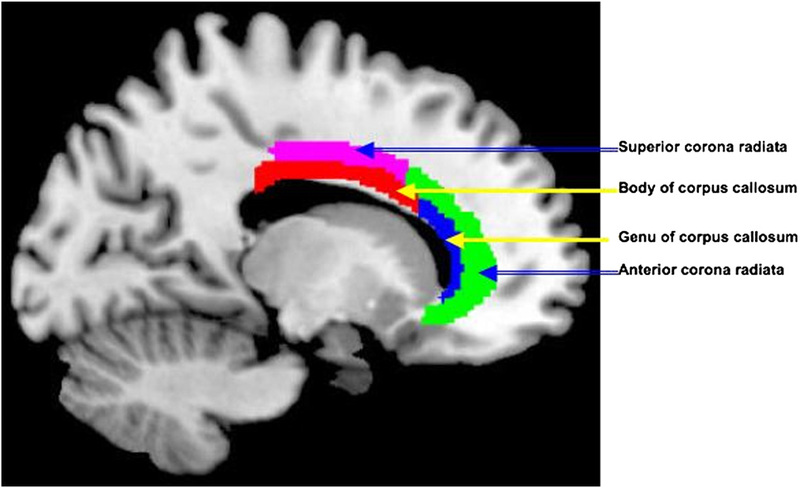 Cortical thickness and pain sensitivity in Zen meditators. Emotion, 10(1), 43-54. 6. Perlman, D. M., Salomons, T. V., Davidson, R. J., & Lutz, A. (2010). Differential effects on pain intensity and unpleasantness of two meditation practices. Emotion, 10(1), 65-71. 7. Rosenzweig, S., Greeson, J. M., Reibel, D. K., Green, J. S., Jasser, S. A., & Beasley, D. (2010). Mindfulness-Based stress reduction for chronic pain conditions: Variation in treatment outcomes and role of home meditation practice. Journal of Psychosomatic Research, 68(1), 29-36. 8. Teixeira, E. (2010). The effect of mindfulness meditation on painful diabetic peripheral neuropathy in adults older than 50 years. Holistic Nursing Practice, 24(5), 277-83. 9. Zeidan, F., Johnson, S. K., Diamond, B. J., David, Z., & Goolkasian, P. (2010). Mindfulness meditation improves cognition: Evidence of brief mental training. Consciousness and Cognition, 19(2), 597-605. 10. Grant, J. A., & Rainville, P. (2009). Pain sensitivity and analgesic effects of mindful states in zen meditators: A crosssectional study. Psychosom Med, 71(1), 106. 11. McCracken, L. M., & Keogh, E. (2009). Acceptance, mindfulness, and values-based action may counteract fear and avoidance of emotions in chronic pain: An analysis of anxiety sensitivity. Journal of Pain, 10(4), 408-415. 12. Rosenzweig, S., Greeson, J. M., Reibel, D. K., Green, J. S., Jasser, S. A., & Beasley, D. (2009). Mindfulness-Based stress reduction for chronic pain conditions: Variation in treatment outcomes and role of home meditation practice. J Psychosom Res. 13. Zeidan, F., Gordon, N. S., Merchant, J., & Goolkasian, P. (2009). The effects of brief mindfulness meditation training on experimentally induced pain. Journal of Pain. This also brings up the issue of PLACEBO. There are plenty of studies to demonstrate that negative expectation can enhance the negative experience. For example, a recent study published in Science Translational Medicine by Bingel and colleagues (“The Effect of Treatment Expectation on Drug Efficacy: Imaging the Analgesic Benefit of the Opioid Remifentanil” – [Link]) found that the effectiveness of pain killers on thermal pain decreased with expectation of receiving pain killers, while just the expectation alone of NOT receiving pain killers exacerbated the pain. In other words, the amount of potent opioid received was constant and the reported experience of pain changed in intensity depending upon expectancy. I bring up Placebo not to make a point that the effects of mindfulness or meditation training can be reduced to a placebo response, but more so to emphasize the powerful capability of the mind to profoundly change experience of the world depending upon OUR EXPECTATION! As it turns out, the mechanisms of pain may be fairly clear (see Melzack’s original 1965 SCIENCE article HERE), but the biopsychsocial influences on the interpretation of pain signals is far from being completely understood. Although over 50 billion dollars is spent on the global pain industry in prescription and over-the-counter pills…these remedies are typically little help, while some like morphine and other opiates can be highly addictive and subject to abuse. Kabat-Zinn, J. (1982). An outpatient program in behavioral medicine for chronic pain patients based on the practice of mindfulness meditation: Theoretical considerations and preliminary results. 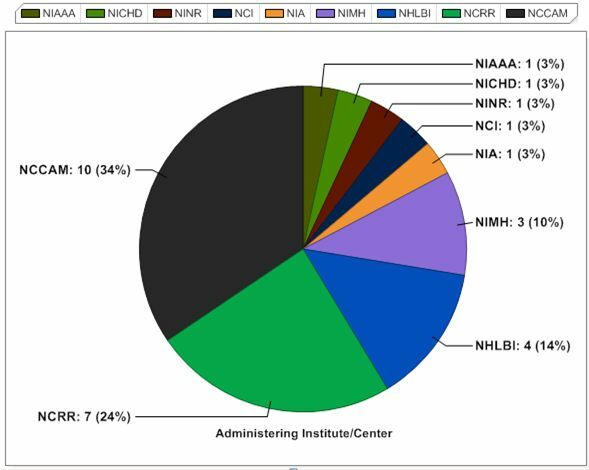 General Hospital Psychiatry, 4(1), 33-47. Kabat-Zinn, J., Lipworth, L., & Burney, R. (1985). The clinical use of mindfulness meditation for the self-regulation of chronic pain. Journal of Behavioral Medicine, 8(2), 163-90. Kabat-Zinn, J., Lipworth, L., Burncy, R., & Sellers, W. (1986). Four-Year follow-up of a meditation-based program for the self-regulation of chronic pain: Treatment outcomes and compliance. Clinical Journal of Pain, 2(3), 159. Kabat-Zinn, J. & Chapman-Waldrop, A. (1988). 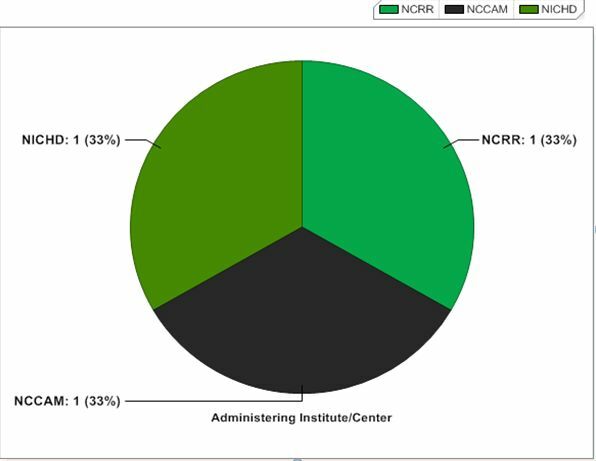 Compliance with an outpatient stress reduction program: Rates and predictors of program completion. Journal of Behavioral Medicine, 11(4), 333-352. Kabat-Zinn, J. (1990). Full catastrophe living: Using the wisdom of your body and mind to face stress, pain, and illness. New York: Dell Publishing. Kabat-Zinn, J., Massion, A. O., Kristeller, J., Peterson, L. G., Fletcher, K. E., Pbert, L., et al. (1992). Effectiveness of a meditation-based stress reduction program in the treatment of anxiety disorders. The American Journal of Psychiatry, 149(7), 936-43. Miller, J. J., Fletcher, K., & Kabat-Zinn, J. (1995). Three-Year follow-up and clinical implications of a mindfulness meditation-based stress reduction intervention in the treatment of anxiety disorders. General Hospital Psychiatry, 17(3), 192-200. Kabat-Zinn, J., Wheeler, E., Light, T., Skillings, A., Scharf, M. J., Cropley, T. G., et al. (1998). Influence of a mindfulness meditation-based stress reduction intervention on rates of skin clearing in patients with moderate to severe psoriasis undergoing phototherapy (UVB) and photochemotherapy (PUVA). Psychosomatic Medicine, 60(5), 625. Carlson, L. E., Speca, M., Patel, K. D., & Goodey, E. (2003). Mindfulness-Based stress reduction in relation to quality of life, mood, symptoms of stress, and immune parameters in breast and prostate cancer outpatients. Psychosomatic Medicine, 65(4), 571-81. Grossman, P., Niemann, L., Schmidt, S., & Walach, H. (2004). Mindfulness-Based stress reduction and health benefits. A meta-analysis. Journal of Psychosomatic Research, 57(1), 35-43. Carlson, L. E. & Garland, S. N. (2005). Impact of mindfulness-based stress reduction (MBSR) on sleep, mood, stress and fatigue symptoms in cancer outpatients. International Journal of Behavioral Medicine, 12(4), 278-85. Carlson, L. E., Speca, M., Faris, P., & Patel, K. D. (2007). One year pre-post intervention follow-up of psychological, immune, endocrine and blood pressure outcomes of mindfulness-based stress reduction (MBSR) in breast and prostate cancer outpatients. Brain, Behavior, and Immunity, 21(8), 1038-49. Carmody, J. and R.A. Baer, Relationships between mindfulness practice and levels of mindfulness, medical and psychological symptoms and well-being in a mindfulness-based stress reduction program. J Behav Med, 2007. Davis, J. M., Fleming, M. F., Bonus, K. A., & Baker, T. B. (2007). A pilot study on mindfulness based stress reduction for smokers. BMC Complementary and Alternative Medicine, 7(2), 1-7. Biegel, G. M., Brown, K. W., Shapiro, S. L., & Schubert, C. M. (2009). Mindfulness-based stress reduction for the treatment of adolescent psychiatric outpatients: A randomized clinical trial. Journal of Consulting and Clinical Psychology, 77(5), 855-66. Chiesa, A. & Serretti, A. (2009). Mindfulness-based stress reduction for stress management in healthy people: A review and meta-analysis. Journal of Alternative and Complementary Medicine , 15(5), 593-600. Gross, C., Cramer-Bornemann, M., Frazier, P., Ibrahim, H., Kreitzer, M. J., Nyman, J., et al. (2009). Results of a double-controlled trial of mindfulness-based stress reduction to reduce symptoms in transplant patients. Explore, 5(3), 156-156. Bazzano, A., Wolfe, C., Zylovska, L., Wang, S., Schuster, E., Barrett, C., et al. (2010). Stress-Reduction and improved well-being following a pilot community-based participatory mindfulness-based stress-reduction (MBSR) program for parents/caregivers of children with developmental disabilities. Disability and Health Journal, 3(2), e6-7. Goldin, P.R. and J.J. Gross, Effects of mindfulness-based stress reduction (MBSR) on emotion regulation in social anxiety disorder. Emotion, 2010. 10(1): p. 83-91. Winbush, N.Y., C.R. Gross, and M.J. Kreitzer, The effects of mindfulness-based stress reduction on sleep disturbance: a systematic review. Explore (NY), 2007. 3(6): p. 585-91. Rosenzweig, S., et al., Mindfulness-based stress reduction for chronic pain conditions: variation in treatment outcomes and role of home meditation practice. J Psychosom Res, 2010. 68(1): p. 29-36. Heidenreich, T., Tuin, I., Pflug, B., Michal, M., & Michalak, J. (1998). Mindfulness-Based cognitive therapy for persistent insomnia: A pilot study. Movement Disorders, 32, 692-698. Williams, J. M., Teasdale, J. D., Segal, Z. V., & Soulsby, J. (2000). Mindfulness-Based cognitive therapy reduces overgeneral autobiographical memory in formerly depressed patients. Journal of Abnormal Psychology, 109(1), 150. Teasdale, J. D., Segal, Z. V., Williams, J. M., Ridgeway, V. A., Soulsby, J. M., & Lau, M. A. (2000). Prevention of relapse/recurrence in major depression by mindfulness-based cognitive therapy. Journal of Consulting and Clinical Psychology, 68(4), 615-23. Teasdale, J. D., Moore, R. G., Hayhurst, H., Pope, M., Williams, S., & Segal, Z. V. (2002). Metacognitive awareness and prevention of relapse in depression: Empirical evidence. Journal of Consulting and Clinical Psychology, 70(2), 275-87. Ma, S. H. & Teasdale, J. D. (2004). Mindfulness-Based cognitive therapy for depression: Replication and exploration of differential relapse prevention effects. Journal of Consulting and Clinical Psychology, 72(1), 31. 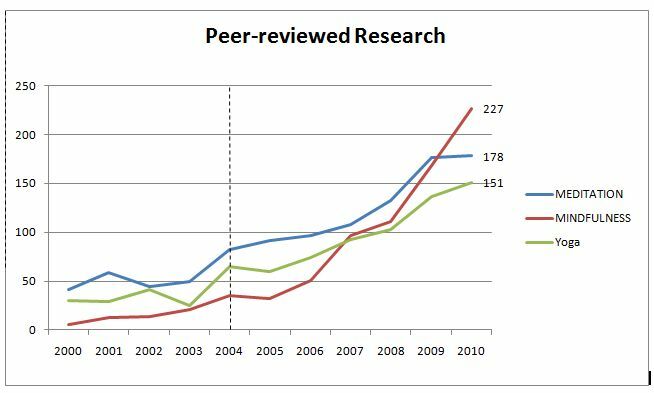 Coelho, H. F., Canter, P. H., & Ernst, E. (2007). Mindfulness-Based cognitive therapy: Evaluating current evidence and informing future research. Journal of Consulting and Clinical Psychology, 75(6), 1000-1005. Bertschy, G. B., Jermann, F., Bizzini, L., Weber-Rouget, B., Myers-Arrazola, M., & van der Linden, M. (2008). Mindfulness based cognitive therapy: A randomized controlled study on its efficiency to reduce depressive relapse/recurrence. Journal of Affective Disorders, 107, 59-60. Kuyken, W., Byford, S., Taylor, R. S., Watkins, E., Holden, E., White, K., et al. (2008). Mindfulness-Based cognitive therapy to prevent relapse in recurrent depression. Journal of Consulting and Clinical Psychology, 76(6), 966-978. Allen, M., Bromley, A., Kuyken, W., & Sonnenberg, S. J. (2009). Participants’ experiences of mindfulness-based cognitive therapy:“It changed me in just about every way possible”. Behavioural and Cognitive Psychotherapy, 37(4), 413-430. Barnhofer, T., Crane, C., Hargus, E., Amarasinghe, M., Winder, R., & Williams, J. M. G. (2009). Mindfulness-Based cognitive therapy as a treatment for chronic depression: A preliminary study. Behaviour Research and Therapy, 47(5), 366-373. Bondolfi, G., Jermann, F., der Linden, M. V., Gex-Fabry, M., Bizzini, L., Rouget, B. W., et al. (2010). Depression relapse prophylaxis with mindfulness-based cognitive therapy: Replication and extension in the swiss health care system. Journal of Affective Disorders, 122(3), 224-31. Britton, W. B., Haynes, P. L., Fridel, K. W., & Bootzin, R. R. (2010). Polysomnographic and subjective profiles of sleep continuity before and after mindfulness-based cognitive therapy in partially remitted depression. Psychosomatic Medicine, 72. Witkiewitz, K., Marlatt, G. A., & Walker, D. D. (2006). Mindfulness-Based relapse prevention for alcohol use disorders: The meditative tortoise wins the race. Journal of Cognitive Psychotherapy, 19, 221-228. Bowen, S., Chawla, N., Collins, S. E., Witkiewitz, K., Hsu, S., Grow, J., et al. (2009). Mindfulness-Based relapse prevention for substance use disorders: A pilot efficacy trial. Substance Abuse, 30(4), 295-305. Witkiewitz, K. & Bowen, S. (2010). Depression, craving, and substance use following a randomized trial of mindfulness-based relapse prevention. Journal of Consulting and Clinical Psychology, 78(3), 362-74. Dumas, J. E. (2005). Mindfulness-Based parent training: Strategies to lessen the grip of automaticity in families with disruptive children. Journal of Clinical Child and Adolescent Psychology, 34(4), 779. Altmaier, E. & Maloney, R. (2007). An initial evaluation of a mindful parenting program. Journal of Clinical Psychology, 63(12), 1231-1238. Vieten, C. & Astin, J. (2008). Effects of a mindfulness-based intervention during pregnancy on prenatal stress and mood: Results of a pilot study. Archives of Women’s Mental Health, 11(1), 67-74. Bögels, S. M., Lehtonen, A., & Restifo, K. (2010). Mindful parenting in mental health care. Mindfulness, 9(2), 1-14. Carson, J. W., Carson, K. M., Gil, K. M., & Baucom, D. H. (2004). Mindfulness-Based relationship enhancement. Behavior Therapy, 35(3), 471-494. Carson, J. W., Carson, K. M., Gil, K. M., & Baucom, D. H. (2006). Mindfulness-Based relationship enhancement (MBRE) in couples. In Baer, R (ed.). Mindfulness-Based Treatment Approaches: Clinician’s Guide to Evidence Base and Applications. Burlingham, MA: Academic Press, pp. 309-31. Basic Mindfulness Program (BMP) [Link] – Shinzen Young leads mini retreats that emphasize a specific theme such as working with emotions, managing physical discomfort, dealing with difficulty concentrating, maintaining practice in daily life and so forth. Taken together they represent a unified ongoing curriculum covering all facets of Mindfulness practice. Davidson, RJ, Dunne, J, Eccles, JS, Engle, A, Greenberg, M, Jennings, P, Jha, A, Jinpa, T, Lantieri, L., Meyer, D., Roeser, RW, Vago, DR. (in press) Contemplative practices and mental training: Prospects for American education. Child Development Perspectives. Siegel DJ. (2007). The mindful brain: Reflection and attunement in the cultivation of wellbeing. New York: Norton. The Relaxation Response (RR) is a state elicited by techniques such as meditation. RR Intervention is a program developed by BHI that includes training in RR techniques and learning about the effects of stress on health. IMPACT OF A CONTEMPLATIVE END-OF-LIFE TRAINING PROGRAM: BEING WITH DYING, by Cynda Hylton Rushton, Deborah E. Sellers, Karen S. Heller, Beverly Spring, Barbara M. Dossey, Joan Halifax, Palliative and Supportive Care (2009), Cambridge University Press. The question that this study addresses is whether meditation practice, specifically meditation on a Deity, or open presence allows practitioners to access a heightened state of visual-spatial awareness. What “heightened” actually refers to physiologically and behaviorally may refer to the ability to maintain complex images in the visual short-term memory for minutes or hours, which is rather long compared to a normal undergraduate student. Such sustained attention in the visualspatial domain may indicate a more developed attentional system and visual-spatial ability. 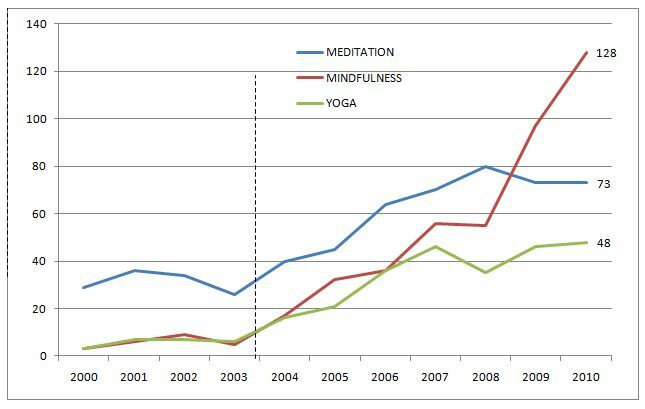 The researchers focused on two styles of meditation: Deity Yoga (DY) and Open Presence (OP). During DY meditation, the practitioner focuses intently on an image of deity and his or her entourage. This requires coming up with an immensely detailed, three-dimensional image of the deity, and also focusing on the deity’s emotions and environment. In contrast, practitioners of OP meditation believe that pure awareness cannot be achieved by focusing on a specific image and therefore, they attempt to evenly distribute their attention while meditating, without dwelling on or analyzing any experiences, images, or thoughts that may arise. These results indicate that DY meditation allows practitioners to access greater levels of visuospatial memory resources, compared to when they are not meditating. The authors state that this finding “has many implications for therapy, treatment of memory loss, and mental training.” Although, they conclude, future studies will need to examine if these results are specific to DY meditation, or if these effects can also occur using other visual meditation techniques. Giuseppe Pagnoni, a Neuroscientist in the dept. of Psychiatry and Behavioral Sciences at Emory University just recently published a study on Zen Meditators and fMRI. 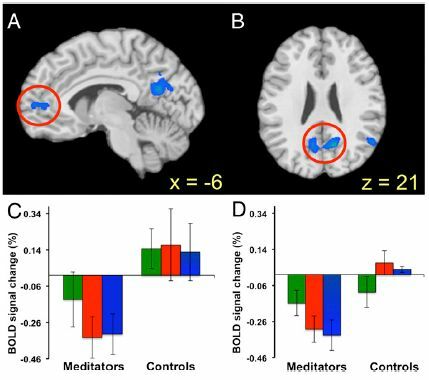 Using fMRI and a simplified meditative condition interspersed with a lexical decision task, they investigated the neural correlates of conceptual processing during meditation in regular Zen practitioners and matched control subjects. While behavioral performance did not differ between groups, Zen practitioners displayed a reduced duration of the neural response linked to conceptual processing in regions of the default network, suggesting that meditative training may foster the ability to control the automatic cascade of semantic associations triggered by a stimulus and, by extension, to voluntarily regulate the flow of spontaneous mentation. See the entire article published in PLoS ONE HERE. The article received press in The New Scientist. “The closest thing to Jedi Mind Tricks” See HERE.